University at Buffalo fans can spend the next five days staring at the NCAA Tournament bracket and dreaming. Go ahead, dream big. Dream of a deep run. The Bulls have nothing to complain about as a result of the pairings revealed Sunday from the NCAA Tournament committee. Could the Bulls have been a No. 5 seed instead of a No. 6? Sure. UB was No. 15 in the NET ratings and No. 18 in the “Strength of Record” metric, two of the analytics the committee considers while making the brackets. But that’s quibbling. The important thing is UB won its last 12 games and avoided a No. 7 seed. That would have been terrible, because the 7s play the 2s in the second round. The No. 2s this year are beasts, especially Tennessee and Kentucky. Instead, UB gets to play the winner of Arizona State vs. St. John’s, which will have to stay on the road to travel from Wednesday’s game in Dayton, Ohio, to Tulsa, Okla., for Friday’s tipoff. Remember how St. Bonaventure ran out of gas last year after winning in Dayton on Tuesday? If UB survives that, it likely gets No. 3 seed Texas Tech, which ranks No. 2 in the nation in defensive efficiency. The Red Raiders’ defense is suffocating. But Texas Tech is not as elite as Tennessee. The Red Raiders are good but not explosive offensively. They don’t shoot a ton of 3-pointers. They aren’t monsters on the offensive glass. UB-Texas Tech would be a slugfest. UB is 19th in the nation in avoiding turnovers. Texas Tech’s offense isn’t running away and hiding from UB. It would be a game in the second half. Furthermore, UB has the weakest No. 2 seed – Michigan – in its bracket if it were to get to the Sweet 16. That’s another advantage of being a sixth seed. You get to avoid the No. 1 seed until the Elite Eight. Hey, I said we’re dreaming big, right? Obviously, Nate Oats’ squad could lose in the first round. Let’s face it, everybody who’s a regular NCAA participant gets upset eventually. Arizona State has wins over fourth-seeded Kansas and fifth-seeded Mississippi State. But Bobby Hurley’s Sun Devils don’t shoot threes or free throws particularly well. St. John’s has a potential NBA draft pick in point guard Sharmonie Ponds. But the Johnnies are not a good rebounding team, aren’t as good on defense as UB and have lost five of their last seven. It’s probably going to be UB-Arizona State. Since 1985, No. 6 seeds reach the second round 63 percent of the time and advance to the Sweet 16 31 percent of the time. The Bulls already seemed to be getting their game face on Sunday night. The Bulls’ defensive Tasmanian Devil has a chip on his shoulder. Dream big, Bulls fans. It doesn’t get much better than this. Here’s an underrated key to the Bulls’ post-season success the past five years: Superb game plans. UB associate head coach Jim Whitesell handles the team’s defensive scouting reports. Whitesell, 59, spent six years as head coach at Loyola Chicago and went a respectable 109-106. He was a head coach for 17 years at lower college levels before that. Whitesell spent two years as an aide at Saint Louis, where he worked under legend Rick Majerus. Then he spent two years at St. John’s before coming to UB. UB assistant Bryan Hodgson, meanwhile, provides the scouting report on personnel – individual strengths and weaknesses of the opponent. Oats resisted the temptation to hire any of his longtime friends as an assistant coach when he got the UB job. A lot of first-time head coaches get themselves into trouble by doing that. You see it in many sports, even the NFL. He hired the best, experienced aide (Whitesell) he could find. He hired the best recruiter he could find (Hodgson). The Bulls will be well prepared Friday, whoever they play. 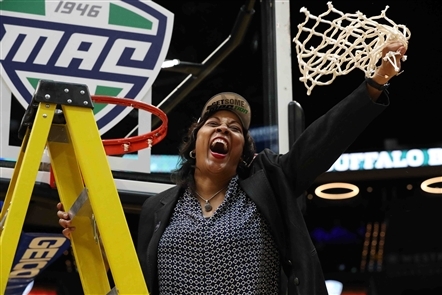 UB women’s coach Felisha Legette-Jack has an uncanny knack of pushing all the right buttons come tournament time. She did it four years ago when the UB women won the MAC Tournament as a No. 8 seed. She did it again in directing the Bulls to a third NCAA berth in four years. 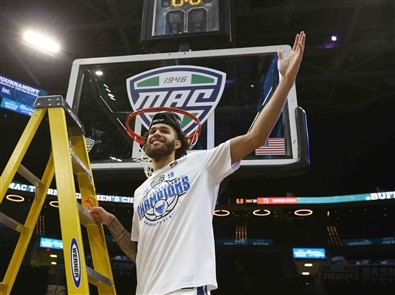 UB’s semifinal upset of top-seeded Central Michigan was yet another FLJ masterpiece. CMU ranked No. 11 in the nation in scoring and No. 6 in the nation in 3-point percentage. 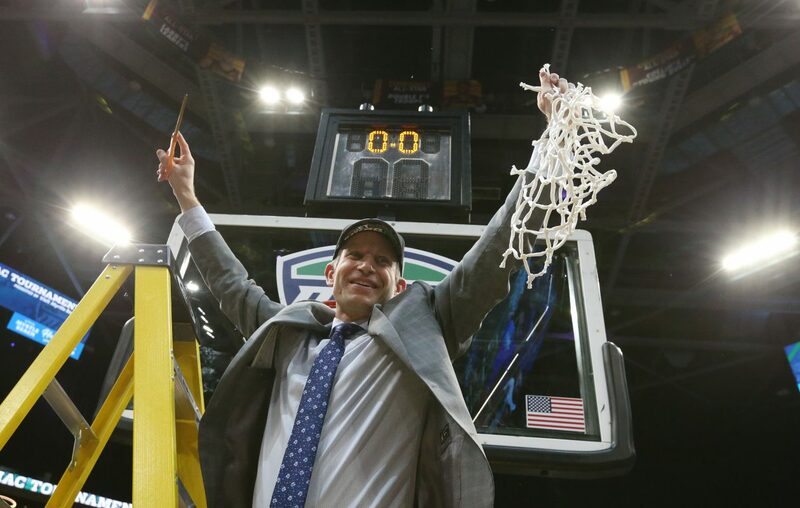 The Chippewas scorched the proud UB defense to the tune of a 100-95 decision four weeks ago. So Legette-Jack adjusted her zone defense, putting 6-foot-1 Summer Hemphill at the top of a 1-3-2 (or 1-2-2), instead of in the middle. That put more length in the face of CMU dead-eye Pressley Hudson. Hemphill had done it some in the past but not recently in the regular season. It was the perfect move at the right time for a UB defense that ranked 130th in defending threes. Hemphill was the long-armed hydra interfering with passes and shots. Hudson, who scored 28 on UB a month before, managed 10 points on 3 of 15 shooting. Then there was Legette-Jack’s point-guard decision, dating back two seasons. It’s amazing UB made the NCAAs this year despite the loss of its all-time greatest point guard, Stephanie Reid, the stir that mixed last year’s Sweet 16 drink. Reid was to UB what Bobby Hurley was to Duke’s title teams – the ultimate floor general, competitor and winner. Someday soon they’re going to hang Reid’s No. 1 jersey from the rafters at Alumni Arena. Two years ago Legette-Jack recruited point guard Hannah Hall, looking past the Hamilton, Ont., native’s obvious shortcoming (her 5-foot-3 height). Like Reid, Hall is an uber-competitive winner. Legette-Jack benched a struggling Hall for the last seven regular-season games. Hall averaged 5.7 points and shot 33 percent this year. But the coach put Hall back in the starting lineup for the MAC Tournament. The sophomore responded by averaging 14.3 points, shooting 61 percent and hitting 11 treys in three games. Legette-Jack is 142-85 (.625) at UB. UB was 75-137 (.354) the seven years before she arrived. She has her fingers on all the right buttons.